How will artists portray our future post-3.11 society, and what role will culture and the arts play? It was questions such as these that occupied the agenda at the international Future Sketch Tokyo conferences. 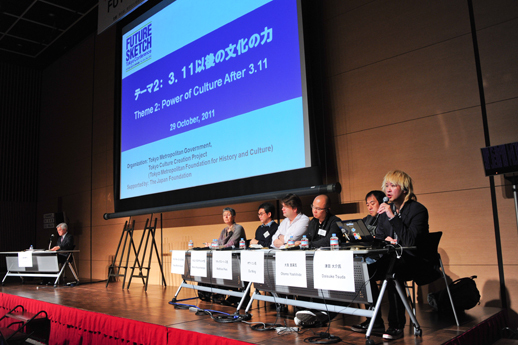 Organized by the Tokyo Culture Creation Project and the Tokyo Metropolitan Foundation for History and Culture, with support and grants from the Japan Foundation, the conference was part of a comprehensive series of arts and cultural events showcased during Tokyo Creative Week (October 20 – 30, 2011). The invited guests were Tessa Morris-Suzuki, a professor of modern Japanese history at the Australian National University; Marco Kusumawijaya, an urban planner from Jakarta; Matthias Pees, chief dramaturg of the Vienna Festival; Ou Ning, a cultural multi-hyphenate from China; musician Yoshihide Otomo; and journalist Daisuke Tsuda. Morris-Suzuki and Kusumawijaya gave the keynote address, suggesting the roles that Tokyo and Japan ought to play after the quake. 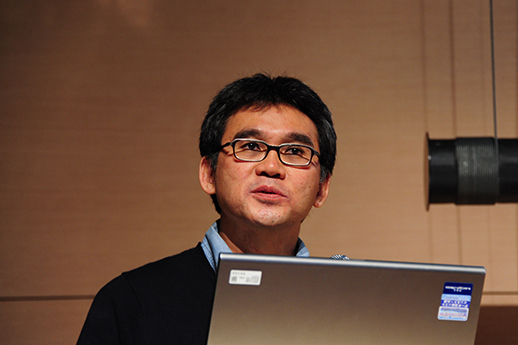 While Morris-Suzuki focused on Japan’s responsibility to the rest of the world in terms of the creative potential of nonprofits and grassroots citizens’ movements in relation to the Fukushima Daiichi nuclear accident, Kusumawijaya suggested that Tokyo offers us an exemplary model of an urban metropolis responding to various environmental problems. 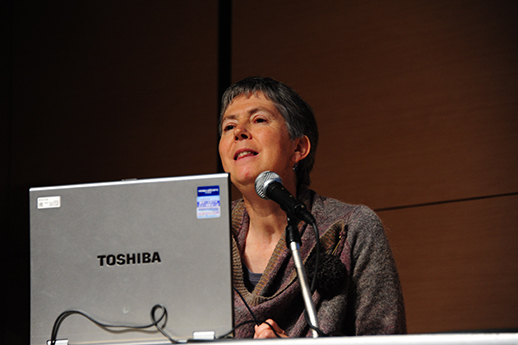 Both commentators expressed a desire for Japan to build on the possibilities of its developed system of social capital and mature civil society, as well as a concern for the necessity of building more ties with civil society leaders and movements in the Asia-Pacific region and elsewhere by tapping the creative potential of citizens and artists. In particular, Morris-Suzuki called for a process of “spiritual and emotional rebuilding” – which would include efforts to recover a sense of identity and self-dignity – rather than just physical reconstruction. In relation to this, Kusumawijaya emphasized the need to draw on the creative energies of artists and creatives. On the second day on the conference, Daisuke Tsuda first of all introduced the previous day’s discussions. He looked back at the debates over the new communities and new leaders brought about by social media such as Facebook, and finally the role that people will play, and the issues surrounding the communication it performs. And then the moderator Taneo Kato (Executive Adviser, Tokyo Metropolitan Foundation for History and Culture) explained about the title of the symposium, which is also the title of this year’s Tokyo Culture Creation Project theme: Tokyo Future Sketch, creating culture for Japan’s future. After he had reported on the background that lead up to the start of the special Future Sketch Book program, the panel discussions could begin. A main topic of discussion was the relationship of art to society – how should we understand the projects and activities of artists in relation to their local communities? Drawing on his experiences in Germany and Brazil, Matthias Pees pointed out that the social function of “art” is seen very differently by people living in countries with dissimilar social structures and histories, and that we should respect the diversity of these artistic initiatives that play out in various communities. Ou Ning, who spoke about an art project in a Chinese rural community called the Bishan Village Harvest Festival, said that he was inspired by the activities of Xie Yingjun, a Taiwanese architect and activist who depended not on monetary contributions, but rather the spirit of mutual aid and assistance to carry out post-quake renewal projects in his native country. Ou pointed out that it was not charitable giving or donations that drove reconstruction, but rather a cooperative spirit sustained by urban intellectuals working in concert with their countryside compatriots. Yoshihide Otomo, on the other hand, showed how artists in Fukushima have taken the lead in expressing their anger about how families have been torn asunder or subjected to severe psychological distress as a result of invisible radiation fears in the local community. Daisuke Tsuda pointed out that social networking services like Twitter and new forms of creative or artistic activism may become indispensable to people from quake-stricken areas who want to continue to maintain emotional or psychological links with the outside world. Although the prevailing view in the West is that civil society in Japan is relatively weak due to the lack of large-scale nonprofits, it is now internationally acknowledged that Japan already has strong, unique grassroots movements in place, as seen in their response to the March 11 earthquake. In fact, movements rooted in a rural sort of community spirit, such as the Tatsue Folk Art Museum1, have been active since the 1920s. Citizen-led movements sprang up after WWII in order to tackle various environmental problems, such as the Minamata disease, leading efforts to restore the damaged reputations of affected areas. Similar initiatives to tackle the nuclear contamination released by the Fukushima nuclear plants can now be seen. Various citizens’ and volunteer groups that were formed after the Great Kobe Earthquake of 1995 have also mobilized in the wake of March 11, including a Fukushima-based network of people concerned about protecting children from radiation. Such “creative” approaches to civil society are not just limited to Japan. They have now become a global trend involving international aid groups that promise to cross national and political boundaries in the future. Currently, the International Atomic Energy Agency (IAEA) has a monopoly on the international research being carried out to protect health interests from radiation. In the wake of March 11, there is a need to establish new international research institutions. Tokyo, in particular, seems to hold some answers to the question of how to deal with the global depletion of natural resources, and the issue of climate change around the world. Commentators have pointed out that Tokyo boasts one of the world’s most efficient public transport systems, as well as an environmental footprint per capita well under the average for both Japan and the rest of the world. As cities in Asia continue to develop, the metropolis of Tokyo provides a possible model in terms of energy sustainability and resource efficiency. As art and culture continue to foster the creativity of Tokyo’s population, its citizens may soon discover possibilities for low carbon footprint lifestyles. Kusumawijaya explained that it takes power to present a vision in culture or the arts, and make the vision a reality. But in order for that artistic power to be exerted, freedom is necessary. Patronage for art is needed from third parties but not control. Although it is important to recognize that art produces economic benefits, art should not simply be subordinated to economic objectives. This is because art and culture need to place an emphasis on innovation arising out of the process and dialogue through which they are created. Questions about internationally determined nuclear power regulations were raised during the Q&A session. Although the themes of the conference – the earthquake and the “power of culture” – were fairly broad, the general atmosphere seemed to gradually grow more optimistic and hopeful about the future as the event progressed. Perhaps this was because of the panelists’ completely different experiences and areas of expertise, which they respectively drew on in order to offer concrete examples of creativity in action, and to tackle the discussion in a way that would connect with the audience. Translated by Darryl Jingwen Wee, from the original Japanese article by Tomoki Sakuta. 1A commemorative museum dedicated to the life of educator and Mingei folk art collector Tatsue Kobayashi (1896-2001), who had ties to Soetsu Yanagi and Bernard Leach. Kobayashi began promoting the free ideals of the Shirakaba school of educators (inspired by Western ideas of liberalism and individualism) in the 1920s.